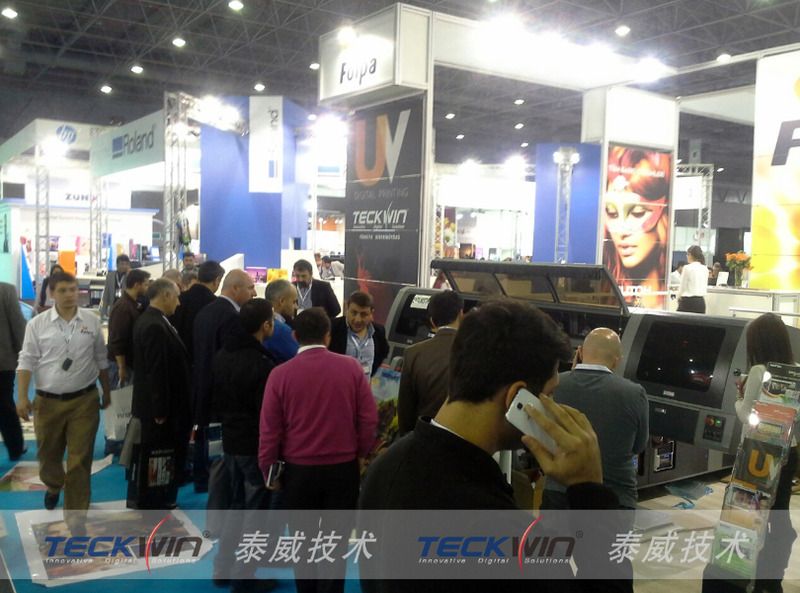 In Early October, Teckwin, together with its distributor Folpa in Turkey appeared in Turkey Advertising Exhibition, displayed TS600 UV flatbed printer. TS600 showed incredible image precision, vibrant color gamut and advanced technology, delivered maximum value, was highly praised by customers during the show time. Prints materials up to 5.9” thick! TS-600 produces dazzling, eye-popping graphics on a wider variety of rigid substrates. The upgradeable platform features a stationary vacuum table with a moving gantry encapsulating the scanning printhead array for exceptionally accurate and repeatable registration and imaging performance. Engineered for reliable and continuous production, the Teckwin TS-600’s unique design enables printing of substrates up to 5.9” thick. Powerful dual vacuum motors on an 8-zone bed with an extensive pin register system help maintaining perfect registration and image fidelity. Dual UV system with shutters provides leading and trailing exposure for superior ink and substrate control. An optional fully featured 54” roll-to-roll system for flexible media is also available on the TS-600. The vibrant and versatile Teckwin AuroraTeck UV inks provide a superior color gamut without sacrificing adhesion or flexibility. Tested and qualified on a wide variety of substrates, AuroraTeck UV inks are proven to provide superior head life at low maintenance. Varnish and specialty inks for ceramics, glass, acrylics and thermoforming are also available UV Flatbed printer needs.